This guidebook covers a broad geographical area loosely centered on the town of North Conway on the eastern side of the White Mountains in New Hampshire. This area is one of the oldest climbing grounds in North America and continues to be one of the most important on the East Coast. The area covered stretches from the crest of the Kancamagus Highway in the west, down through the Mount Washington Valley, and over to the crags of Evans Notch and the Bethel area in Western Maine. Many of the cliffs covered in this book have appeared in previous guidebooks to the area, notably Ed Webster's Rock Climbs in the White Mountains of New Hampshire, East Volume, published in 1995, and Stewart Green's Rock Climbing New England, a select guidebook published in 2001. However, in the years since these books appeared, a huge amount of route development has taken place. Most of the established cliffs, such as Cathedral Ledge, have seen the addition of many new routes; but perhaps even more important is the development of many new or nearly-new cliffs which appear here in print for the first time. Ray Rice on Two Nuts for You at Shell Pond. As a climbing venue, this huge area has a lot to offer. The superb granite outcrops, such as Cathedral and Whitehorse Ledges, are well known for housing an incredible collection of traditional routes across the grades. 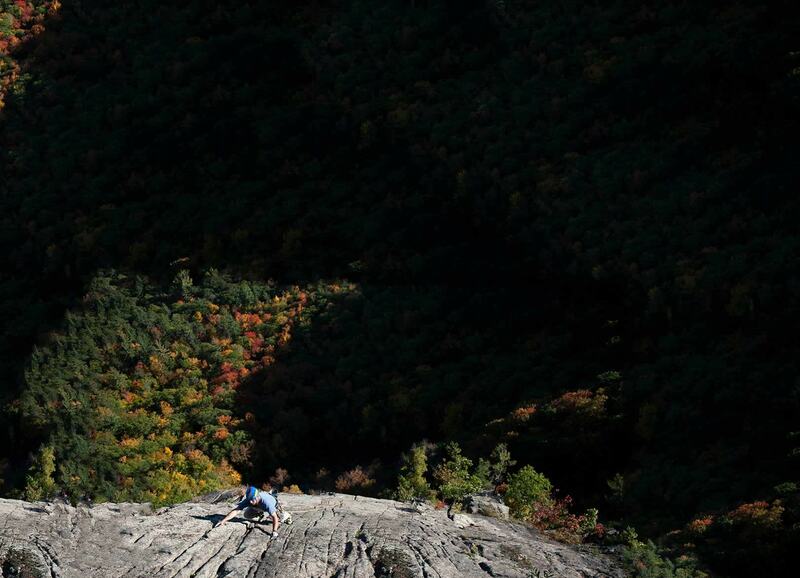 In recent years the tremendous potential of the schist cliffs of Western Maine has begun to be tapped, the result being a large and growing collection of sport climbs, including some of the best in New England. The unique appeal of back country climbing in the White Mountains has continued to be a draw for some climbers. In particular, the remote crags of the Upper Kancamagus area have seen a big surge of activity and the addition of many new routes. Add it all up, and you have about 2000 rock climbs of all grades and styles, probably representing one of the most diverse collections of routes to be found in any single area in the country. This guidebook includes detailed descriptions of almost all the routes in the area. This is not a compilation of descriptions from other sources, rather, the information included in this book relies, as much as possible, on firsthand experience, with descriptions having been completely rewritten and rechecked. As well as the written descriptions, this guidebook makes extensive use of photodiagrams, custom-drawn maps, and GPS data to ease the process of finding the cliff, finding the climb, and finding the route. My goal has been to make this the most usable, accurate, and detailed guidebook to the Eastern White Mountains to date. A graded list of sport and trad climbs. A history of climbing in the area. A database of new routes. A database of updates, omissions and errors. A database of downloadable GPS approaches to the cliffs. This will include the tracks, waypoints etc., that I recorded when checking approach descriptions. These can be downloaded and used in other GPS devices to assist with navigation. A database of general interest material. This will include scans of old magazine articles and a large catalogue of photographs. There are a few cliffs that never made it into the book, particularly in Western Maine. These sections will be available on the website, although the information will be a lot less reliable and detailed than in the guidebook itself.